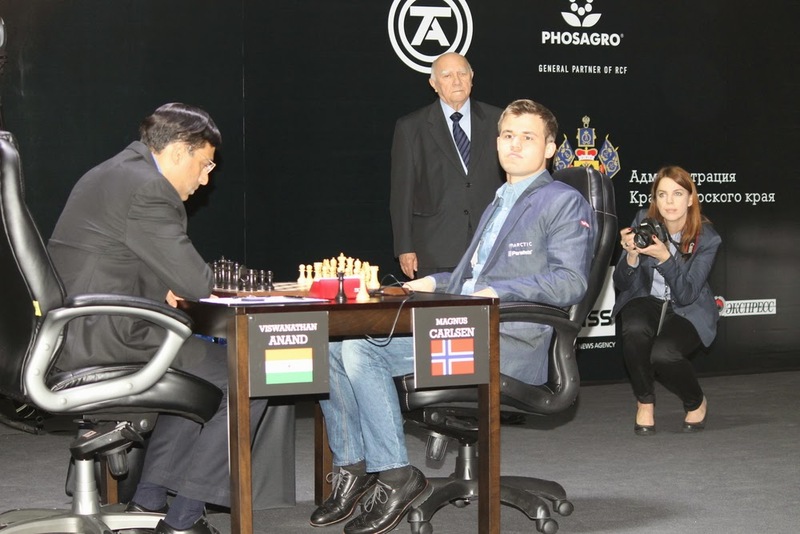 The second game of the World Chess Championship match between the champion Magnus Carlsen and the former champion Vishwanathan Anand took place in the Main Media Center in Sochi on November 9th. The Norwegian grandmaster played White. In the opening Magnus Carlsen showed a new idea aimed against the Berlin variation, which is currently the most dreadful line for those who like to start the game with е2-е4. Vishy Anand successfully rearranged his pieces and obtained a solid and safe position. However, such course of events apparently made Anand too relaxed, as later the Indian started making superficial and inaccurate moves. The World Champion found a very energetic plan – he transferred the queenside rook on the kingside and created a direct attack against the king. White's strategy looked very straightforward and obvious, but it turned out difficult for Black to parry the threats. At the press-conference Anand blamed his 18th move and suggested18…Qf7 instead, pushing the opponent's queen away from its strong position. Carlsen agreed with him, saying he did not obtain much out of the opening apart from slight initiative. However, after 19.Rg3 he already was quite optimistic. The computer considers Black's 20th move a nearly decisive error, as after it Anand was forced to defend a hopeless position. However, the only defense (20…Kh8) looks very unnatural for a human player. During the subsequent game Anand could defend more tenaciously, but the problems he had to solve were severe in any case. The World Champion converted his advantage in a calm manner, without forcing the events. The match score is currently 1.5-0.5 in Carlsen's favor. Monday, November 10th is a day off. Both players said they will relax and do some sport. The third game is played on Tuesday, November 11th. Vishy Anand has White. Admission is free of charge; spectators have an opportunity to follow a live grandmaster commentary or to play speed chess with a unique chess robot, developed by Konstantin Kosteniuk. The official website of the championship http://www.sochi2014.fide.com/ broadcasts live grandmaster commentary in Russian and English. The World Chess Championship match consists of 12 games with a classical time control: 120 minutes for 40 moves, then 60 minutes for 20 moves, and then 15 minutes plus 30 second per move until the end of the game. If the match is tied, a tie-break will be played on November 27th.